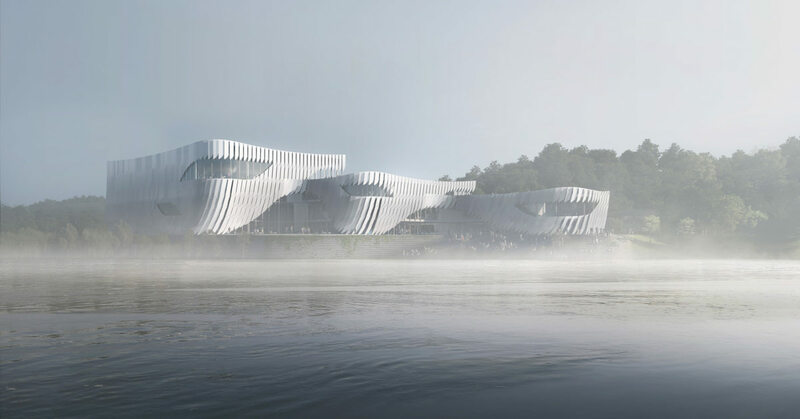 As part of an open design contest, Alison Brooks Architects submitted a concept design for Lithuania’s new €30M M.K. Čiurlionis Concert Centre in Kaunas. 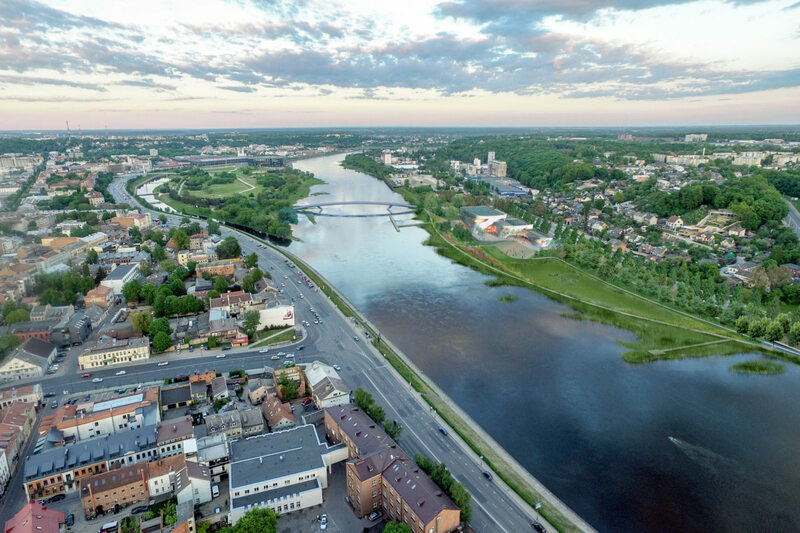 Our scheme offered an organic, poetic and integrated relationship between the Concert Centre, the banks of the Nemunas River, neighbouring Aleksotas and the City of Kaunas. The centre’s stepped massing rises from two and three storeys at the main street to four storeys, celebrating the main auditorium volume at the riverfront. 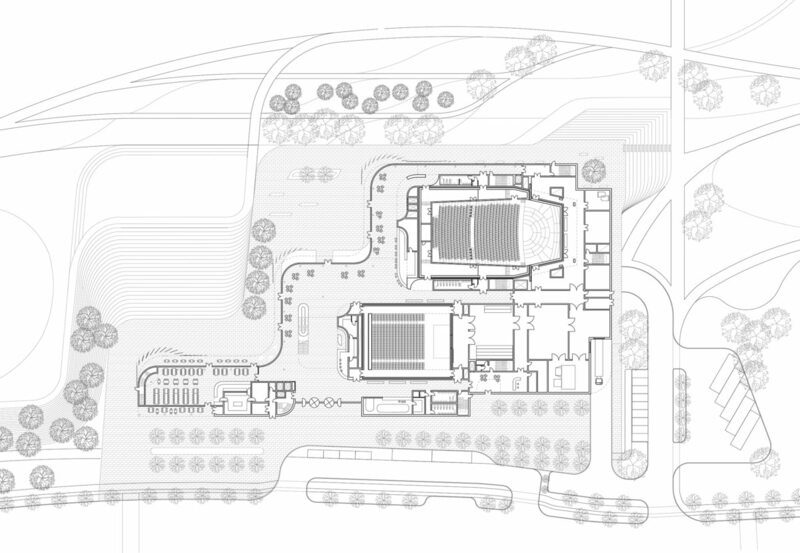 The building’s meandering plan form fluidly connects a series of distinctive exterior public spaces with the parkland walk. 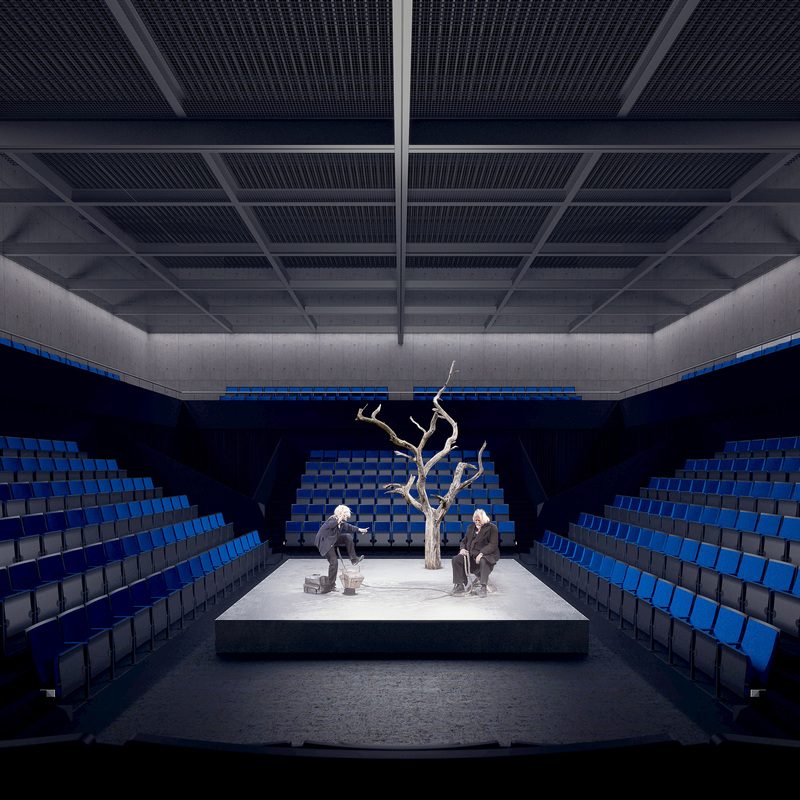 A south facing entrance square leads to both the centre’s foyers and the 1500 seat amphitheatre that gently mediates between floodplain, park and building podium. 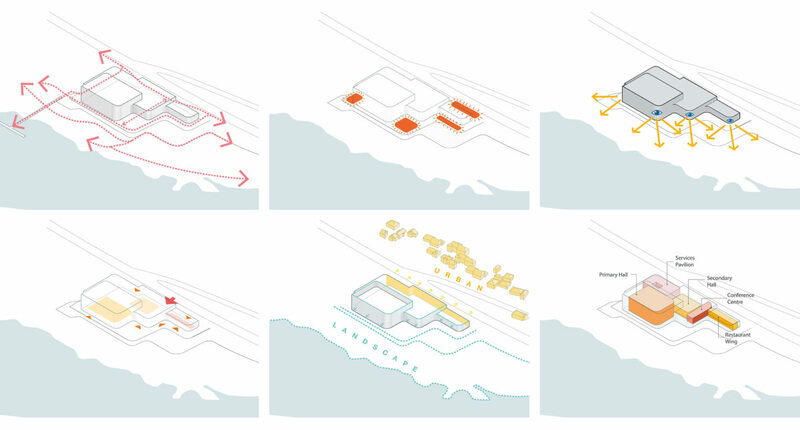 This spatial sequence culminates in a panoramic public square that projects dramatically toward the river. 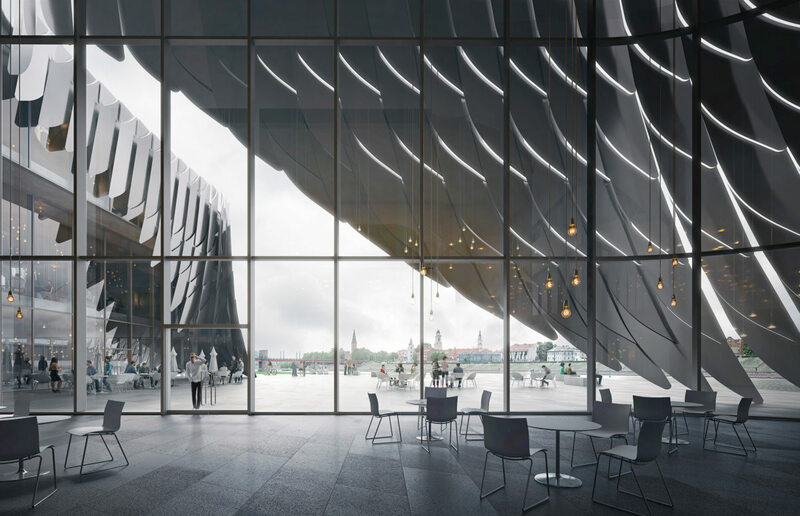 Framed and sheltered by shimmering ‘wings’, the centre is both civic stage and a serene balcony to the city of Kaunas. Our design was inspired by the creative works of MK Čiurlionis where depictions of angels, birds and the cosmos describe a conceptual link between spiritual life, nature and Lithuanian culture. 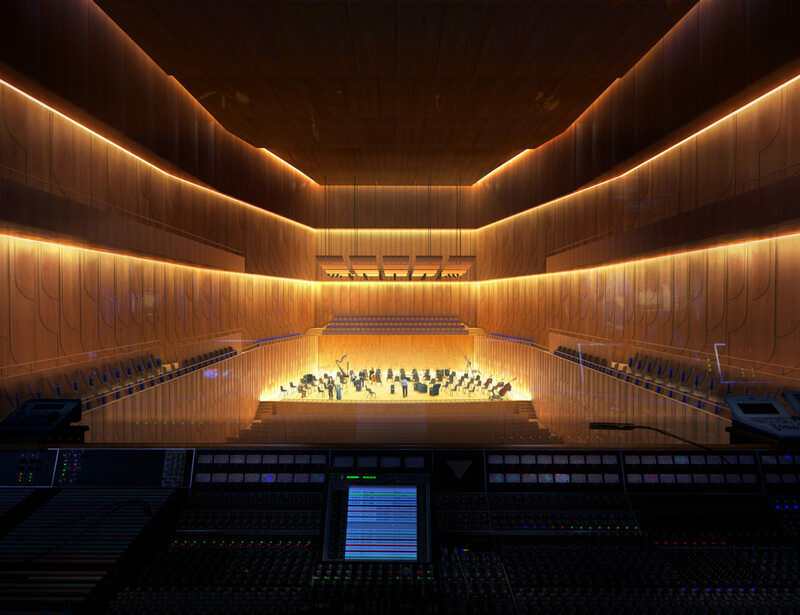 Drawing on this symbolic tradition we adopted the wing, light yet strong and perfectly engineered, as a powerful architectonic motif for the concert centre. 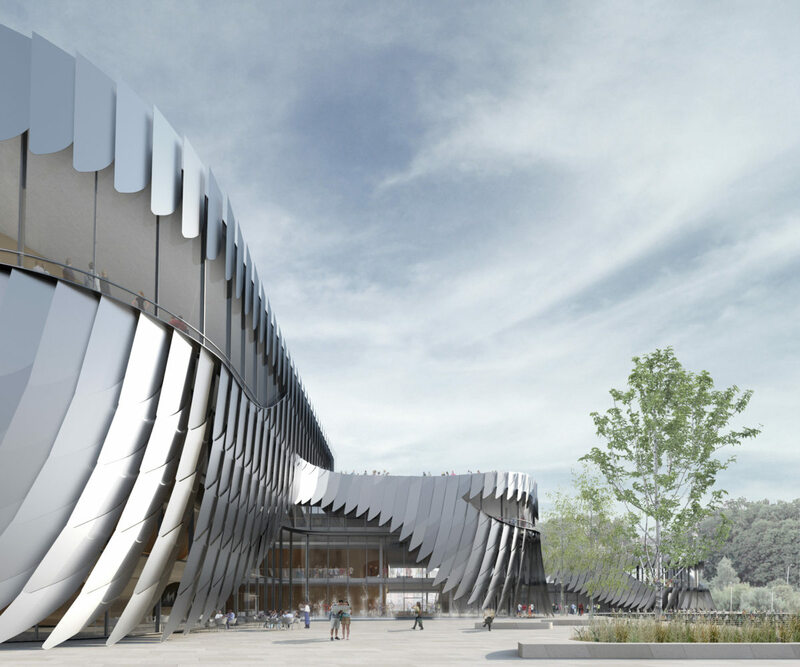 Seen from the city, this is a winged architecture that gently touches the ground, light emanating through and beneath its sweep of shading metallic ‘feathers’. As a counterpoint, its south façade is a translucent curtain wall that creates a formal, scaled relationship to its neighbourhood context. 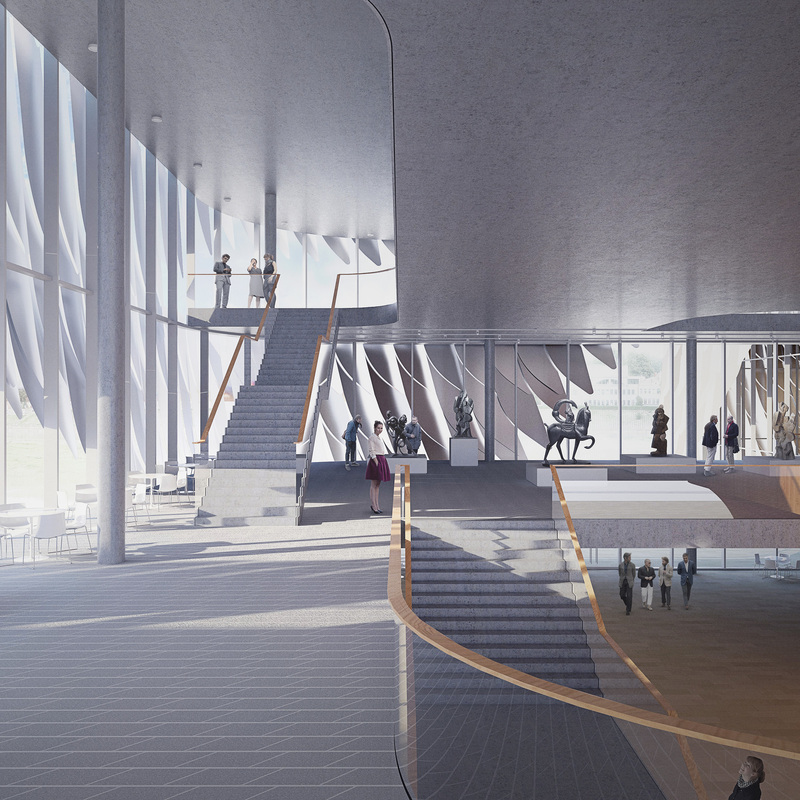 Inside, interlocking double and triple height foyer spaces allow the two auditoria volumes to be clear and legible. A grand staircase draws visitors to upper foyers and the 2nd floor conference centre. The ‘west wing’ holds cafeteria and restaurant, with outdoor terraces overlooking park and city. The building’s flowing spatial journey culminates at its top floor, a panoramic fine dining restaurant that captures the Kaunas sunset. Monumental timber and brass volumes define the two auditoria, anchoring the foyers with sculptural gravitas. 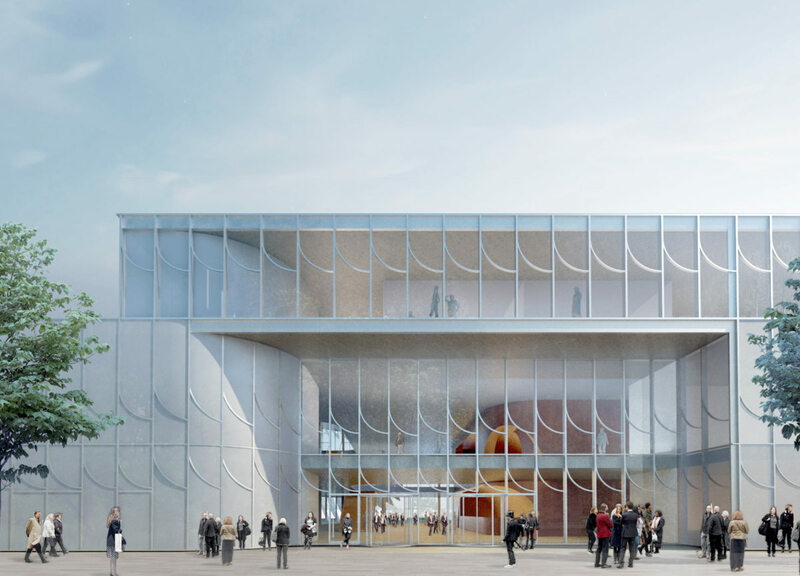 Spherical cuts into these volumes announce the reception, bar and retail areas, and draw audiences to the auditorium entrances. The feathered cladding creates a quality of spatial embrace, offering places of filtered shade or of light. Forests, meadows, wetlands and bogs define the centre’s setting. A densely planted hillside frames the great lawn and meadows to the west, creating space for large concerts, festivals and community events. The outdoor amphitheatre flows from the avenue toward the river. To the east a smaller meadow surrounds the existing trees. The woodland screens the existing buildings enclosing outdoor areas for picnics, play and exercise with views to the river ferry and pedestrian bridge to the island. Bands of tall coloured and textured river edge planting create habitat for birds and insects. When the river rises, the building is reflected in water surrounded by marginal planting. Timber decks extend to the water’s edge providing spaces for outdoor classrooms or quiet contemplation. 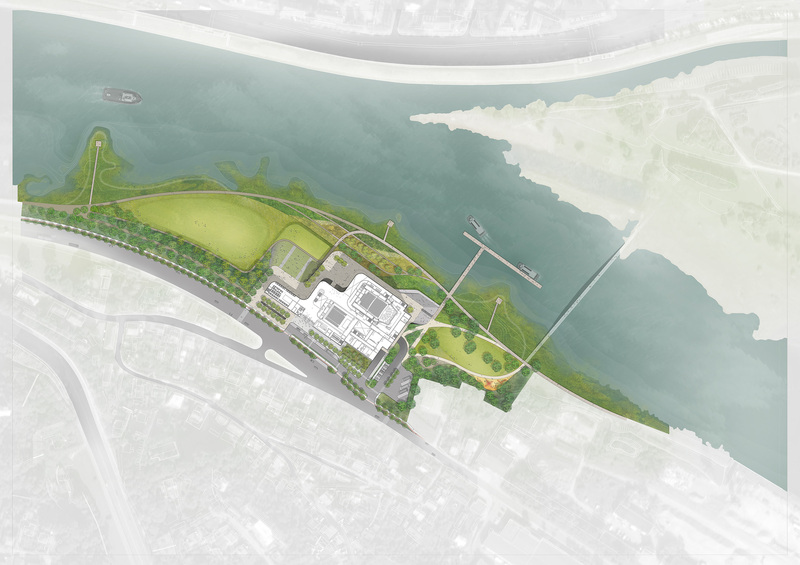 Pathways sweep and embrace the site allowing the visitor to experience the changing landscape as the river rises and recedes against the flowing façade.